The diagram and table below can be used to indicate condensate generated due to heat loss in insulated steam pipes. The table is based on a surrounding temperature of 20 oC and 80% insulation efficiency compared with uninsulated pipes. At a surrounding temperature -20 oC approximately 50% condensate load should be added. Engineering ToolBox, (2003). Condensate Generated in Insulated Steam Pipes (kg/h per 100m). 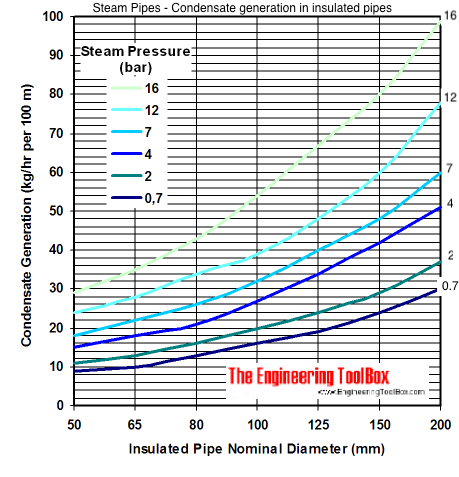 [online] Available at: https://www.engineeringtoolbox.com/condesate-insulated-steam-pipes-d_263.html [Accessed Day Mo. Year].